Havanese a Happy New Year! Dear friends, I hope you are enjoying the holiday season! I have been so busy beading holiday orders for my Etsy shop this month, that I haven’t had much time for anything else. Today, I would like to share with you one of my recent custom orders. This dog pin was inspired by an adorable Havanese named Nacho. Here is the finished product. It is not an exact replica, but I feel it is a pretty good likeness. Beadwork always makes the piece seem a bit larger, especially when I add layered beaded fringe as I did on the dog’s face. I think this effect adds to the whimsy of the piece.. Here, I used several different shades of black, gray, and white 15/o seed beads. I also used gray 13/o Charlottes on the dog’s front legs to add a bit more dimension. The dog’s owner was pleased with the outcome. What do you think? I still have a few more beadwork orders to catch up on this week. Please stop by my Facebook or Instagram pages to view any updates. Also, I would like to mention that my New Year Sale is now happening on Etsy! All ready-to-ship beaded dog jewelry, beading patterns, bead kits, and art will be 20% off now through January 5, 2018! No coupon needed! Thanks for looking and have a safe and Happy 2018!! Dear friends, last week a customer sent me a photo of her beautiful Borzoi named Duma. 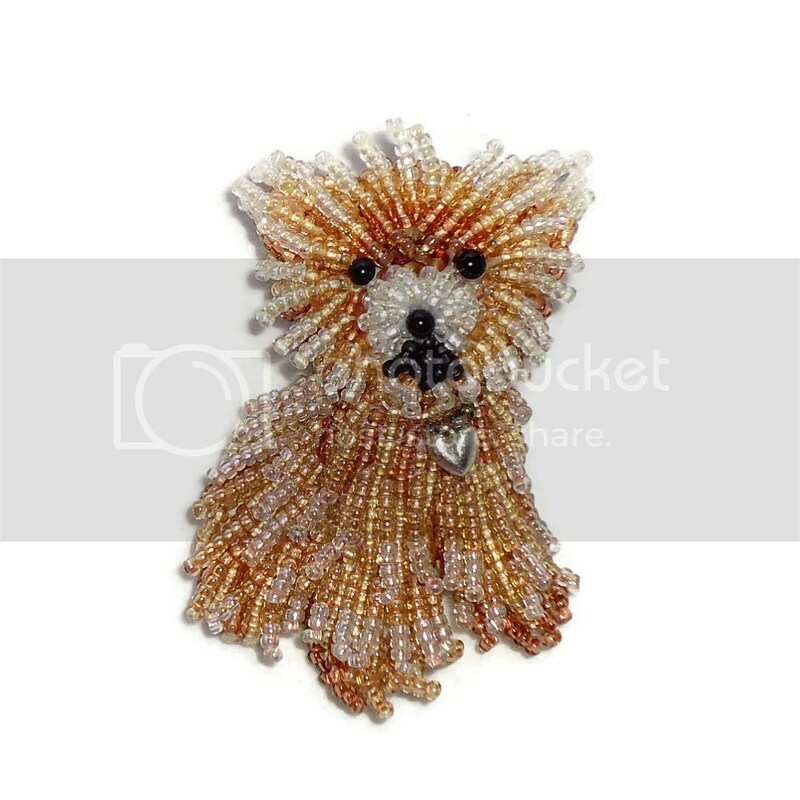 She asked me to create a custom beaded pin which looks like her dog. First, I cut out several layers of felt and stitched them together. Then, I added a tiny glass nose and eyes. Then, I began stitching tiny Japanese size 15 glass seed beads to the felt 2-3 at a time. 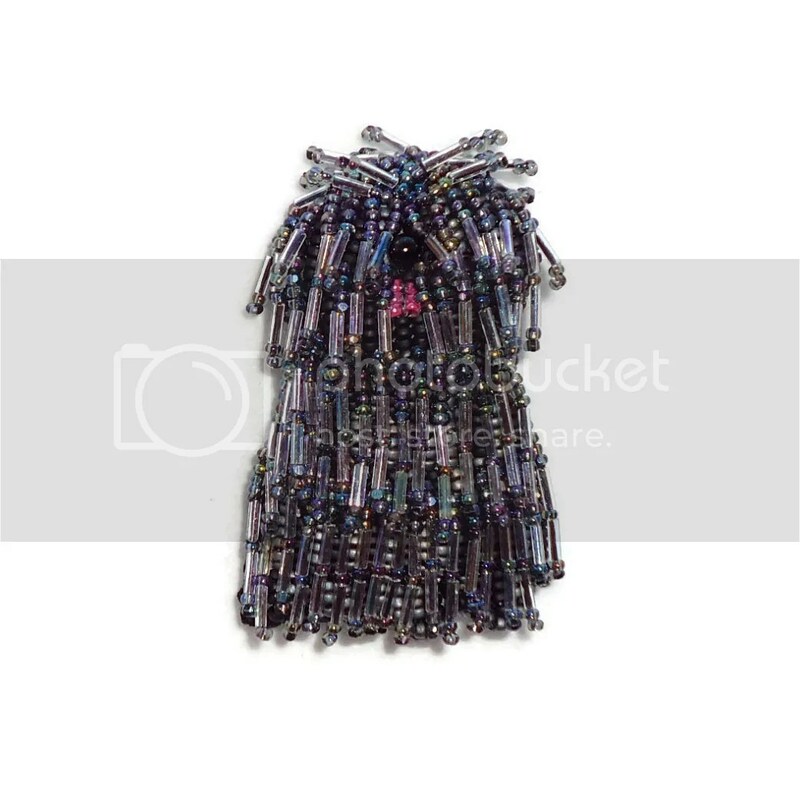 When the majority of the bead embroidery was complete, I added beaded fringe and a leather collar with sterling silver heart charm. A pin finding is sewn to the back and beadwork is backed with Ultrasuede. Upcoming Event in New York City! Dear friends, I have some exciting news! I have been invited to be this month’s guest speaker at the Bead Society of Greater New York & you are invited to attend! Church of the Holy Apostles. 296 9th Avenue @ 28th Street. Dear friends, I had a wonderful time visiting the San Diego Bead Society! I was only there for a few days, but the weather was gorgeous. I was happy to take a walk on the beach and go hiking at Torrey Pines State Natural Reserve! Please see more photos on the San Diego Bead Society’s Facebook page. 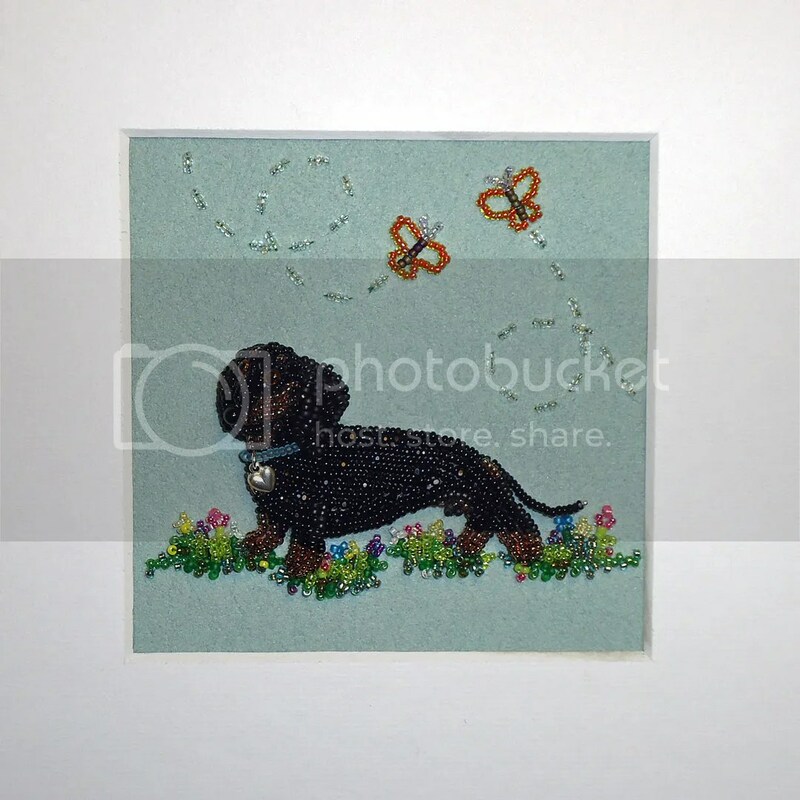 And, since I’ve returned, I have also created a new custom beaded pet portrait, Dachshund in Flower Garden. This piece was inspired by a little dog named Frankie. It features tiny bead-embroidered multi-color flowers and butterflies. Framed in an 8×8″ shadowbox frame. Click to view it in the frame. 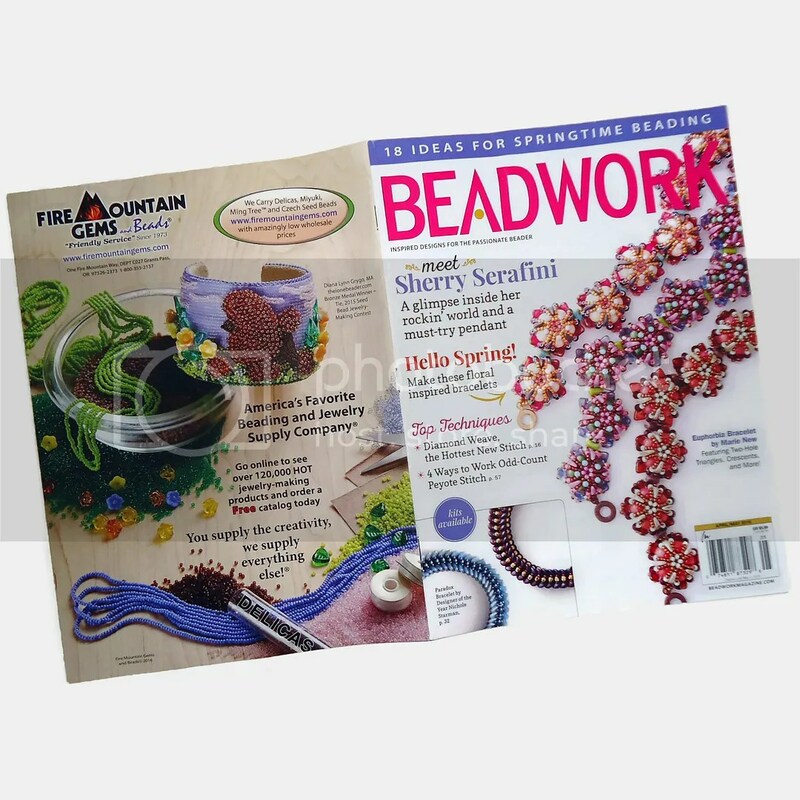 Featured on Beadwork Magazine Cover! Dear friends, check out the April/May 2016 issue of ‪Beadwork Magazine‬! My ‪beaded‬ ‪Poodle‬ cuff bracelet has been featured on Fire Mountain Gems‘ back cover ad! This piece is available for sale in my Etsy shop. Follow me on Facebook and Instagram for more updates. Thank you for your interest in my beadwork!